Andrii Khrabustovskyi works at our faculty in the group Nonlinear Partial Differential Equations and is a member of the CRC Wave phenomena: analysis and numerics. He was born in Kharkiv in the Ukraine and finished his studies as well as his PhD at the Kharkiv National University and the Institute for Low Temperature Physics and Engineering of the National Academy of Sciences of Ukraine. He joined our faculty in 2012 as postdoc in the former Research Training Group 1294 Analysis, Simulation and Design of Nanotechnological Processes, which was active until 2014. Gudrun Thäter talked with him about one of his research interests Asymptotic analysis and homogenization of PDEs. Photonic crystals are periodic dielectric media in which electromagnetic waves from certain frequency ranges cannot propagate. Mathematically speaking this is due to gaps in the spectrum of the related differential operators. For that an interesting question is if there are gaps inbetween bands of the spectrum of operators related to wave propagation, especially on periodic geometries and with periodic coeffecicients in the operator. It is known that the spectrum of periodic selfadjoint operators has bandstructure. This means the spectrum is a locally finite union of compact intervals called bands. In general, the bands may overlap and the existence of gaps is therefore not guaranteed. A simple example for that is the spectrum of the Laplacian in which is the half axis . The classic approach to such problems in the whole space case is the Floquet–Bloch theory. Homogenization is a collection of mathematical tools which are applied to media with strongly inhomogeneous parameters or highly oscillating geometry. Roughly spoken the aim is to replace the complicated inhomogeneous by a simpler homogeneous medium with similar properties and characteristics. In our case we deal with PDEs with periodic coefficients in a periodic geometry which is considered to be infinite. In the limit of a characteristic small parameter going to zero it behaves like a corresponding homogeneous medium. To make this a bit more mathematically rigorous one can consider a sequence of operators with a small parameter (e.g. concerning cell size or material properties) and has to prove some properties in the limit as the parameter goes to zero. The optimal result is that it converges to some operator which is the right homogeneous one. If this limit operator has gaps in its spectrum then the gaps are present in the spectra of pre-limit operators (for small enough parameter). The knowledge of the limit operator is helpful and only available through homogenization. For finite domains Floquet Bloch does not work well. Though we always have a discrete spectrum we might want to have the gaps in fixed position independent of the size of our domain. Here the homogenization theory works in principle also for the bounded case (it is just a bit technical). For holes of the same order as the period (even slightly smaller) the Dirichelet conditions on the boundary of holes dominate -- the solution for the corresponding Poisson equation tends to zero. For significantly smaller holes the influence on the holes is so small that the problem "forgets" about the influence of the holes as the parameter goes to zero. There is a borderline case which lies between cases 1 and 2. It represents some interesting effects and can explain the occurance of so-called strange terms. 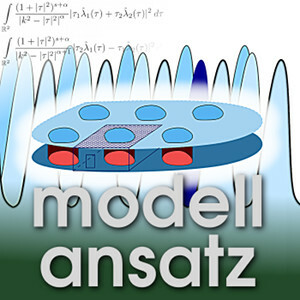 A traditional ansatz in homogenization works with the concept of so-called slow and fast variables. The name comes from the following observation. If we consider an infinite layer in cylindrical coordinates, then the variable r measures the distance from the origin when going "along the layer", the angle in that plane, and z is the variable which goes into the finite direction perpendicular to that plane. When we have functions then the derivative with respect to r changes the power to while the other derivatives leave that power unchanged. In the interesting case k is negative and the r-derivate makes it decreasing even faster. This leads to the name fast variable. The properties in this simple example translate as follows. For any function we will think of having a set of slow and fast variables (characteristic to the problem) and a small parameter eps and try to find u as where in our applications typically . One can formally sort through the -levels using the properties of the differential operator. The really hard part then is to prove that this formal result is indeed true by finding error estimates in the right (complicated) spaces. There are many more tools available like the technique of Tartar/Murat, who use a weak formulation with special test functions depending on the small parameter. The weak point of that theory is that we first have to know the resulat as the parameter goes to zero before we can to construct the test function. Also the concept of Gamma convergence or the unfolding trick of Cioranescu are helpful. An interesting and new application to the mathematical results is the construction of wave guides. The corresponding domain in which we place a waveguide is bounded in two directions and unbounded in one (e.g. an unbounded cylinder). Serguei Nazarov proposed to make holes in order to make gaps into the line of the spectrum for a specified wave guide. Andrii Khrabustovskyi suggests to distribute finitely many traps, which do not influence the essential spectrum but add eigenvalues. One interesting effect is that in this way one can find terms which are nonlocal in time or space and thus stand for memory effects of the material. P. Exner and A. Khrabustovskyi: On the spectrum of narrow Neumann waveguide with periodically distributed δ′ traps, Journal of Physics A: Mathematical and Theoretical, 48 (31) (2015), 315301. A. Khrabustovskyi: Opening up and control of spectral gaps of the Laplacian in periodic domains, Journal of Mathematical Physics, 55 (12) (2014), 121502. A. Khrabustovskyi: Periodic elliptic operators with asymptotically preassigned spectrum, Asymptotic Analysis, 82 (1-2) (2013), 1-37. S.A. Nazarov, G. Thäter: Asymptotics at infinity of solutions to the Neumann problem in a sieve-type layer, Comptes Rendus Mecanique 331(1) (2003) 85-90. S.A. Nazarov: Asymptotic Theory of Thin Plates and Rods: Vol.1. Dimension Reduction and Integral Estimates. Nauchnaya Kniga: Novosibirsk, 2002.